April is the one of the last months for viewing the Orion constellation. In fact, you have probably been looking at it for the last few months (or you would have, weather permitting). So this article points out a few things you might not know about the major stars in Orion. The closest of the major stars in Orion is Saiph. Don't know Saiph ? It's down by the left foot of the hunter. It is 720 light years away. Betelgeuse is about 450 light years distant. If Betelgeuse was located where the Sun is, Earth, Mars and possibly Jupiter would be inside the star. Betelgeuse will eventually explode as a nova or supernova. When will this occur? Some say it could happen tomorrow, others say it will be millions of years. Should you check with your insurance company? Probably not. Betelgeuse is about 400 light years away and a supernova would have to be within 100 light years to be a serious threat. Although we think of Betelgeuse as the left shoulder of Orion, the name means something closer to armpit. Bellatrix is 240 light years away, close enough that it seems unlikely to have been formed from the same cloud of dust that created most of the Orion stars. Bellatrix is probably the only one of Orion's major stars that won't explode at some point in time. It is found at the right shoulder of Orion. Rigel is actually the brightest star in Orion despite the designation "Beta Orionis". At a SJAA meeting I asked a question about planet formation around large stars using Rigel as an example. The answer is that Rigel is so large and powerful, it blew away the rest of its protoplanetary disk. In fact, Rigel is probably a dying star having exhausted its supply of hydrogen and is now burning helium into oxygen and carbon. 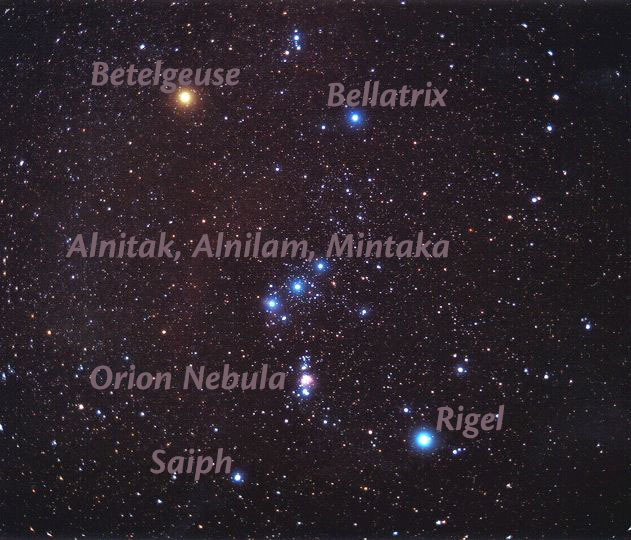 The stars of Orion's belt are, from left to right, Alnitak, Alnilam and Mintaka. The three stars are similar. They are all blue-white giants that will eventually supernova. They appear to be nearly equal in magnitude so the intrinsically brightest would have to be the one furthest away. That would be Alnilam around 1300 lights years distant. Alnitak is 870 light years away and Mintaka is 915 light years distant. All of these stars were formed from the same interstellar cloud that also is the source of the Great Nebula in Orion. The Great Nebula is also M42 and M43, magnificent views of a stellar nursery and a star party favorite. At a recent star party a young observer said that it looked like cotton candy. Not a bad description. The nebula is further from earth than the other stars we mentioned, 1500-1800 light years away. The four bright stars in the center, the trapezium, have actually blown out a hole in the nebula that let's us see inside. The trapezium is actually a multiple star system designated as Theta Orionis. One vital source for this article is a set of web pages at http://www.astro.uiuc.edu/~kaler/sow/saiph.html - substitute another star name for "saiph" to find information about other stars. A nice website for information on the Trapezium in the Orion Nebula is here.